Hope you had a wonderful Thanksgiving! Lewis Park is taking part in the global giving movement #GIvingTuesday, this Tuesday, November 28th, as a Seattle Parks Foundation site. 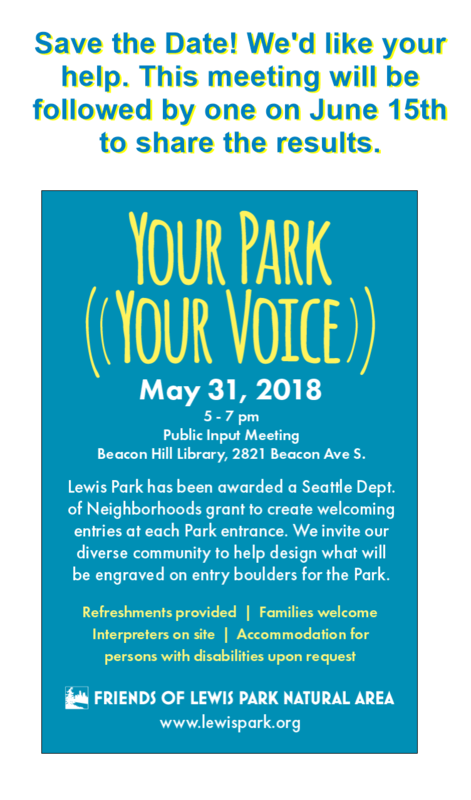 You can support the continued restoration of Lewis Park by donating through the Lewis Parks page on the Seattle Parks Foundation site. No amount is too small! If Lewis Park receives 15 or more individual donations, of any amount, the park will receive an additional $1,000 match. Thank you for your consideration. #GivingTuesday is a global day of giving fueled by the power of social media and collaboration. Celebrated on the Tuesday following Thanksgiving and the widely recognized shopping events Black Friday and Cyber Monday, #GivingTuesday kicks off the charitable season, when many focus on their holiday and end-of-year giving. Learn more about #GivingTuesday at GivingTuesday.org. Friends of Lewis Park would like to thank all the volunteers who braved the windy conditions last Saturday for Green Seattle Day! Lewis Park is an old growth forest which means that during high winds there is potential for falling branches. Due to safety concerns, we decided to reschedule our Green Seattle Day event at Lewis Park for this Saturday, November 19th and Sunday, November 20th. This is great news for those who missed out last Saturday! Saturday, November 19, 9 a.m. – 12 p.m.
Sunday, November 20, 9 a.m. – 12 p.m.
Friends of Lewis Park will provide coffee, hot chocolate, snacks, tools, gloves, and guidance. We will meet both days at the Daejeon Park Pagoda 1144 Sturgus Ave. S. Free street parking is available along Sturgus Ave. S on both sides of the street. Questions? Please email Friends of Lewis Park with any questions you might have. We look forward to seeing you this Saturday and Sunday for the continued restoration of Lewis Park! This Saturday is Green Seattle Day at Lewis Park! New path in Lewis Park! Lewis Park is an official site for Green Seattle Day 2016 on Saturday, November 12, 9 a.m. – 12 p.m.! If you haven’t had a chance to visit Lewis Park before, Green Seattle Day is a great opportunity to finally see the natural area for yourself. Green Seattle Day is also a fun half day event for those who have volunteered with us before or visited in the past to come out and see all the incredible progress that is being made in Lewis Park. It’s easy to get involved, just sign up online to help us know how many volunteers to expect. Read on for more information about Green Seattle Day at Lewis Park and please reach out with any questions. What is Green Seattle Day? Green Seattle Day is Green Seattle Partnership’s largest annual community event that brings together hundreds of volunteers to plant thousands of plants in parks throughout Seattle. The 2015 Green Seattle Day brought out almost 800 volunteers to 16 different forested parks in our city to plant a total of 5,896 trees and other plants. This fun half day event is open to all ages and all community members are welcome. Come get involved in planting the next generation of forests in our community. No previous experience is necessary! FREE LUNCH and prizes will be provided at the Green Seattle Day Hub, Camp Long, after-party for all Green Seattle Day volunteers. What will be happening at Lewis Park for Green Seattle Day? Volunteers will have the opportunity to plant native ground covers, shrubs and trees in the southern section of Lewis Park. This plays a critical role in the restoration of Lewis Park as it helps slow or stop the return of invasive plant species that negatively impact the health of the natural area. Friends of Lewis Park will provide snacks, tools, gloves, and guidance – we hope to see you on November 12th! Getting involved is easy, just sign up online to help us know how many volunteers to expect. How can I learn more about getting involved with Green Seattle Day at Lewis Park? Check out the Lewis Park Green Seattle Day registration page which contains additional details about the event. Questions? Please email Friends of Lewis Park with any questions you might have. ​While not required, we ask that volunteers sign up online in advance to ensure we have adequate materials on hand. See you at Lewis Park for Green Seattle Day 2016! Friends of Lewis Park is excited to announce that the Lewis Park Natural Area trail is finally moving in to the construction phase! We want to thank everyone for their support and patience while our Seattle Parks Project Manager, Garrett Farrell and design team headed by Mark Hafs of Hafs-Epstein waded through a much longer permitting process than initially anticipated. The project was bid in August 2016 and Seattle Parks awarded the contract to WS Contractors. The contractor began work to construct the new trail in late September. Construction of the new trail is anticipated to take about six months and is weather dependent. The project includes a new trail through the natural area that runs north to south. A portion of the trail will travel across new elevated structures and allow visitors to the natural area to enjoy areas currently inaccessible due to the steepness of the terrain. The trail will improve pedestrian circulation, provide better accessibility for people with disabilities, and create better access for continued site restoration. The Friends of Lewis Park will use the trail for their ongoing stewardship and educational activities. 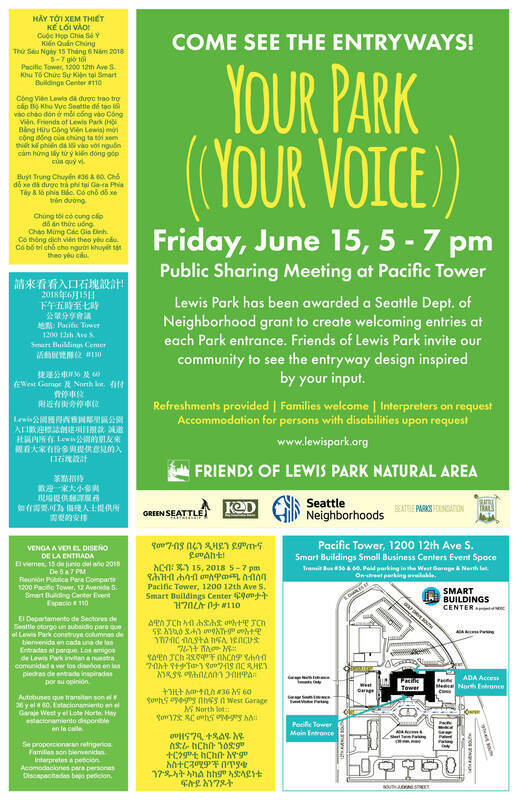 More information on construction can be found on the Seattle Parks Lewis Park website as it becomes available. Friends of Lewis Park is continuing restoration volunteer events throughout trail construction. Lewis Park has been selected as a Green Seattle Day location for the big event on Saturday, November 12th! Join us at Lewis Park, 9 a.m. - 12 p.m. as we plant a new area in the southern end of Lewis Park. Green Seattle Day is Green Seattle Partnership’s largest event of the year bringing together hundreds of volunteers to plant thousands of plants in parks throughout The Emerald City. This event is family-friendly, open to all ages and all community members are welcome! Get involved and help plant the next generation of forests in our community. FREE LUNCH and prizes provided at the Green Seattle Day Hub, Camp Long, after-party for all Green Seattle Day volunteers. Visit Green Seattle Partnership for more information and to register in advance. See you at Lewis Park! Have you noticed our new look? It’s official, we now have a logo for Friends of Lewis Park! A portion of the King Conservation District grant we were awarded went to creating our new logo and outreach materials. Thanks to Katrina of Creative Breath for a the beautifully designed logo! Let us know what you think and keep an eye out for our updated postcards around the Beacon Hill community. There’s lots going on at the park this summer. 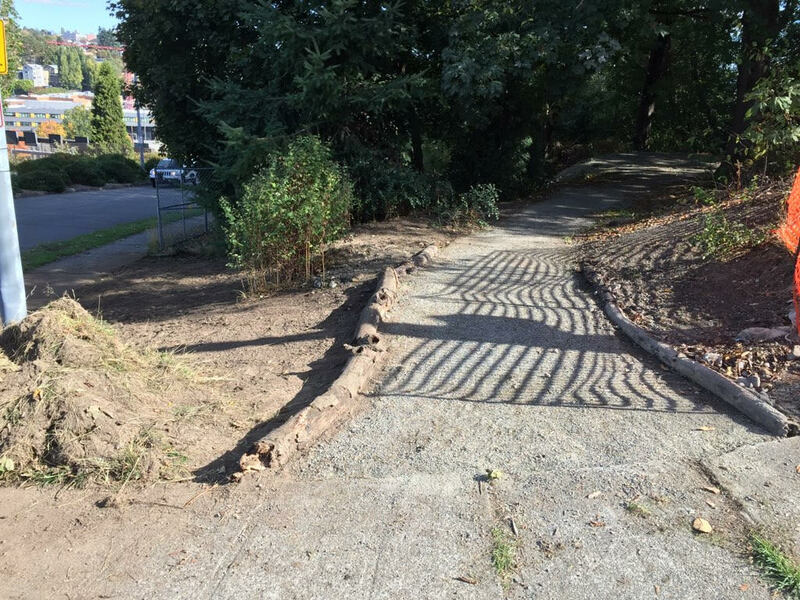 We’re continuing to build new segments of the upper trail and working hard to keep the new native plants alive that were installed in the spring by the Beacon Hill International School students. Cross your fingers with us that we'll get the go ahead to start constructing the main trail sometime in early 2016. Come out anytime and check out the in-progress trail directly across from Pacific Medical Tower on Golf Drive and join us for our volunteer events at Lewis Park Natural Area on most Sundays of the month. We don’t meet on the last Sunday of the month and Green Seattle Partnership has the most up to date volunteer event schedule. Hope to see you out at the park! Future Forest Stewards of Lewis Park! Beacon Hill International School students were hard at work out at Lewis Park this May and June. Check out these photos of these amazing future forest stewards- great job everyone! !